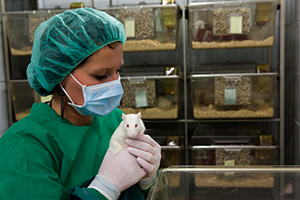 The In Vivo Services (IVS) Core in the Department of Comparative Medicine provides rodent colony management at the UW. IVS staff will oversee the maintenance, breeding, weaning, identification, and record keeping of your mouse and rat colonies to free up the limited and valuable time of your laboratory personnel. In addition, the IVS Core offers an array of technical services performing procedures such as sample collection, sample administration, metabolic testing, behavioral assays, and testing of drug compounds in rodents. All services through the IVS Core are charged on an hourly tech time rate.